MatrixNet is a method of machine learning developed by Yandex. 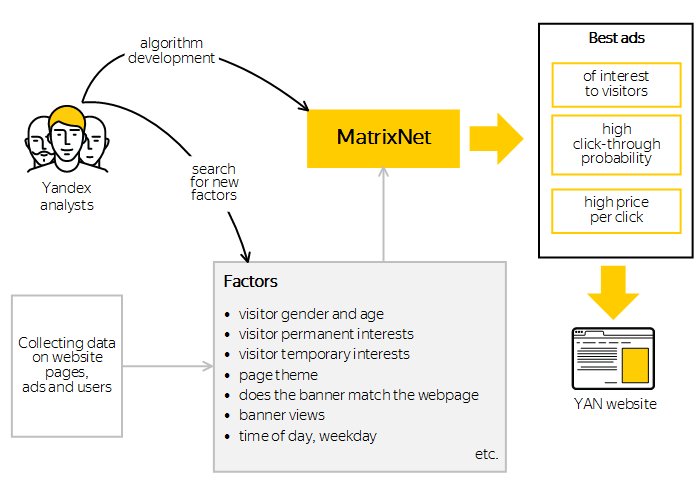 This technology is used to construct the Yandex ranking formula (read about how you can apply MatrixNet in search technologies). In 2011, Yandex began using this technology to select ads on the Advertising Network. MatrixNet uses more than 120 ranking factors to predict the click probability for each ad. The technology uses both socio-demographic data collected by the system as well as information about user behavior and interests. Machine learning lets us perfect the formula by adding new factors to it. The selection mechanism is configured in such a way that a partner site will display only those ads that could bring the maximum revenue through an optimal combination of cost-per-click and ad attractiveness to the user. We always strive to provide users with the most precise answer, and this applies to ads as well. MatrixNet lets us expand the number of factors that we consider when displaying ads on the Advertising Network, which means that our ads better match the interests of users as well as the goals of advertisers and site owners. After we implemented MatrixNet, the CTR of ads on the Advertising Network increased by more than 20%.